A Third Party Collection Agency is a company or individual who specializes in collecting outstanding debts for other businesses or individuals. A Debt Purchaser/Factoring Company is a company or individual who purchases accounts with the intent of collecting debts owed. While all applicable fields within the Metro 2® Format should be reported, these guidelines provide specific values that apply to Debt Buyer and Collection Agency accounts. Report at least on a monthly basis. Report the complete name, address and social security number of the legally liable consumer(s), using the joint section for reporting secondary names. The first time you report to the consumer reporting agencies, report your entire file. On subsequent updates, report the entire file, or at a minimum, newly opened accounts, paid accounts, and accounts which have had changes since the previous reporting period. Report paid in full collection accounts before purging the accounts from your internal collection system. Do not delete paid in full collection accounts. Accounts which have been canceled and returned to creditor. Accounts which have been forwarded or sold to another entity. All parties reporting credit information must comply with the Fair Credit Reporting Act (FCRA), Fair Debt Collection Practices Act (FDCPA), any applicable state laws and regulatory authorities. The Date of First Delinquency is used to comply with FCRA sections 605 and 623 (obsolescence period). 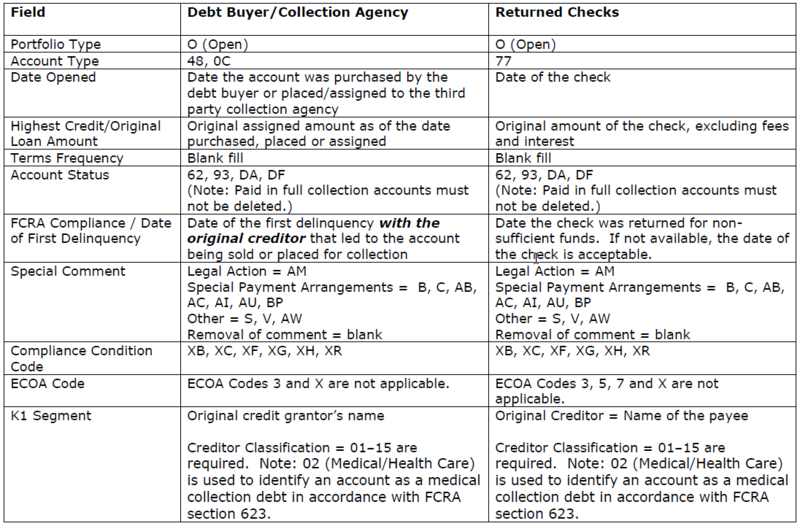 The Creditor Classification 02 Medical/Health Care must be reported under Original Creditor to identify medical debts to comply with DCRA sections 605 and 623. In the Identification Number field, report the internal code that identifies the third party collection agency/debt purchaser/factoring company where information is verified. · If the account number changes, report the new account number by using the "Change" function. See the "Account Information" help section under "What is...." for more information. Note: Notify your consumer reporting agencies the first time this situation occurs. 4. Date Opened — the date the account was placed/assigned to the third party collection agency or purchased by the debt purchaser/factoring company. When reporting returned checks, provide the date the check was written. 5. Highest Credit or Original Loan Amount — original assigned amount as of the date placed, assigned or purchased. When reporting returned checks, report the original amount of the check, excluding fees and interest. · 93 — Account assigned to internal or external collections. · 62 — Paid in full, was a collection account. · Collection Agencies must delete accounts that have been canceled and returned to the creditor. · Debt Purchasers/Factoring Companies must delete accounts that have been forwarded or sold to another entity. 8. FCRA Compliance/Date of First Delinquency — the date of the first delinquency with the original creditor that led to the account being placed for collection or sold. Account is assigned to collection agency or sold to debt purchaser/factoring company. insufficient funds. If not available, report the date of the check. (iii) the creditor did not previously report the date of delinquency to a consumer reporting agency and the date of delinquency cannot be reasonably obtained as provided in clause (ii), the person establishes and follows reasonable procedures to ensure the date reported as the date of delinquency precedes the date on which that account is place for collection charged to profit or loss, or subjected to any similar action, and reports such date to the credit reporting agency. 9. Report Compliance Condition Codes and Special Comments in conjunction with Account Status Codes to further define the accounts. Compliance Condition Code XB (Account information disputed by consumer) could be reported with Account Status Code 93. Special Comment AU (Account legally paid in full for less than the full balance) could be reported with Account Status Code 62. 10. Current Balance — balance amount, which may include fees and interest, depending on state and federal laws. If payments are made, the Balance amount should decrease accordingly. 11. ECOA Code — used to designate an account as joint, individual, etc. in compliance with the Equal Credit Opportunity Act (ECOA). Note: Authorized users (ECOA Code 3) should not be reported because they are not contractually liable. 12. Consumer Information Indicator —used to specify that a consumer has filed bankruptcy or a consumer cannot be located. Refer to Exhibit 9 in the Metro 2 Format for a list of available indicators. 13. Report the name of the original creditor and the creditor's classification. When reporting returned checks, report the name of the payee in the Original Creditor Name field. Report Creditor Classification 02 Medical/Health Care when reporting medical debts and returned checks from providers medical services, products or devices. CDIA policy and some state laws stipulate that the original creditor must be identified. The purpose of reporting the original creditor name is to help consumers identify the source of accounts when they appear on credit reports. Without the original creditor names, consumers may not know what the accounts represent. Federal law stipulates that the name of the payee must be identified when reporting returned checks. It also stipulates that medical debts must be identified.